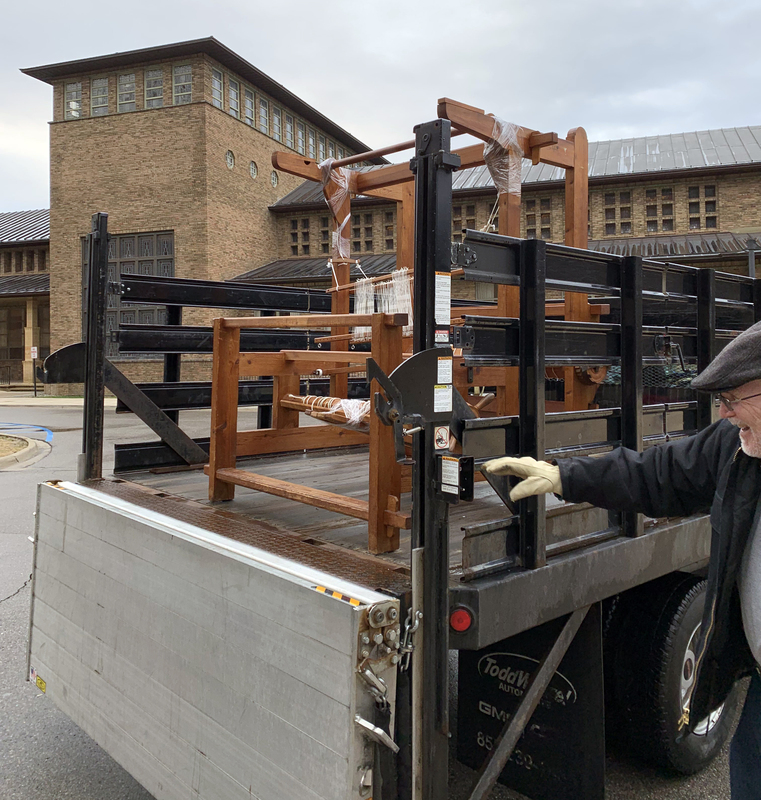 In preparation for the Center’s upcoming show, Studio Loja Saarinen: The Art and Architecture of Weaving, 1928-42, we recently moved a historic Cranbrook Loom from the Kingswood Weaving Studio across campus to Saarinen House. The Cranbrook Loom at home in the Kingswood Weaving Studio. 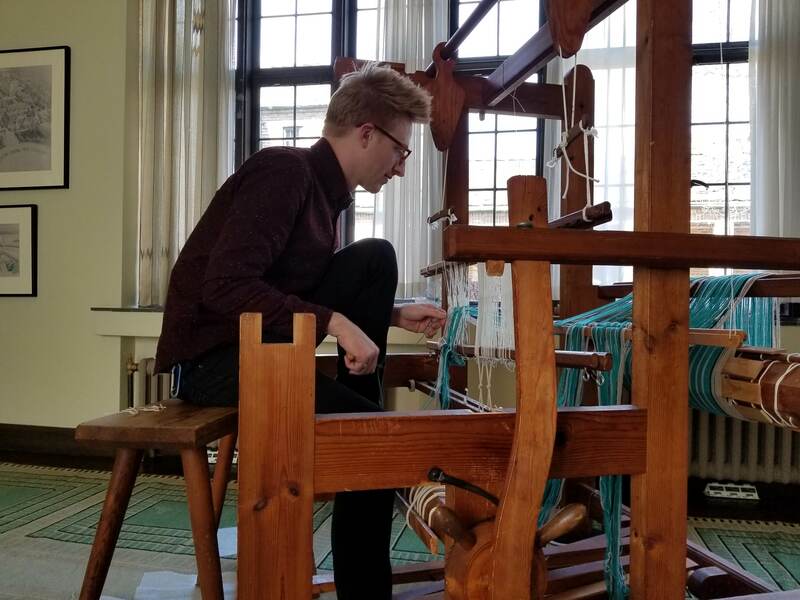 I wanted a Cranbrook Loom to be a part of the exhibition as a teaching and demonstration tool, so guests can understand how the many beautiful rugs on display were produced. 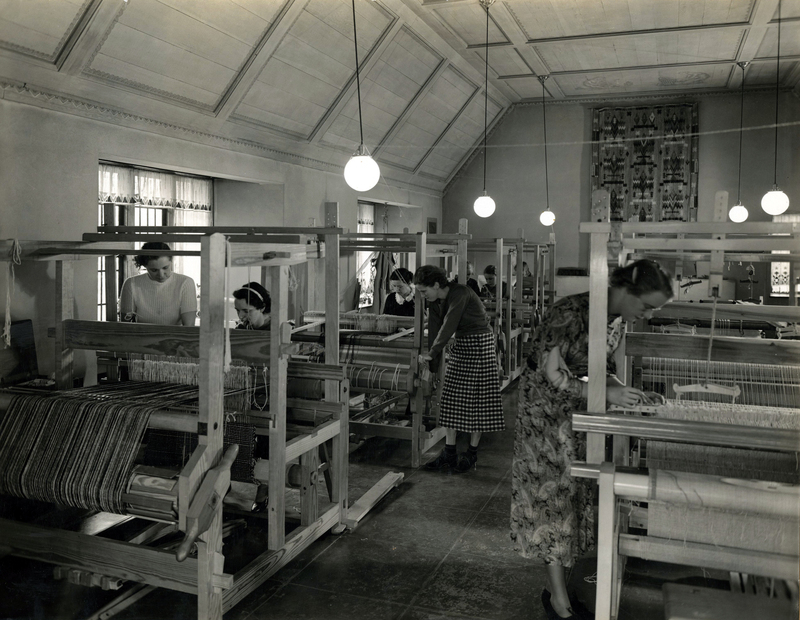 Studio Loja Saarinen started with just one loom in 1928, but grew to include thirty-five. The original looms used by the Studio were quite heavy and difficult to work with; Saarinen’s unhappiness with them eventually resulted in her demand for a loom built exactly to her specifications. She worked with John Bexell, a skilled cabinet maker and husband of one of the Studio’s weavers, Marie, to construct a loom that was lighter, sturdier, and easier to operate. The first Bexell loom was delivered in 1936. Bexell (or Cranbrook) looms in the Cranbrook Weaving Studio, April 1936. Cranbrook Archives. 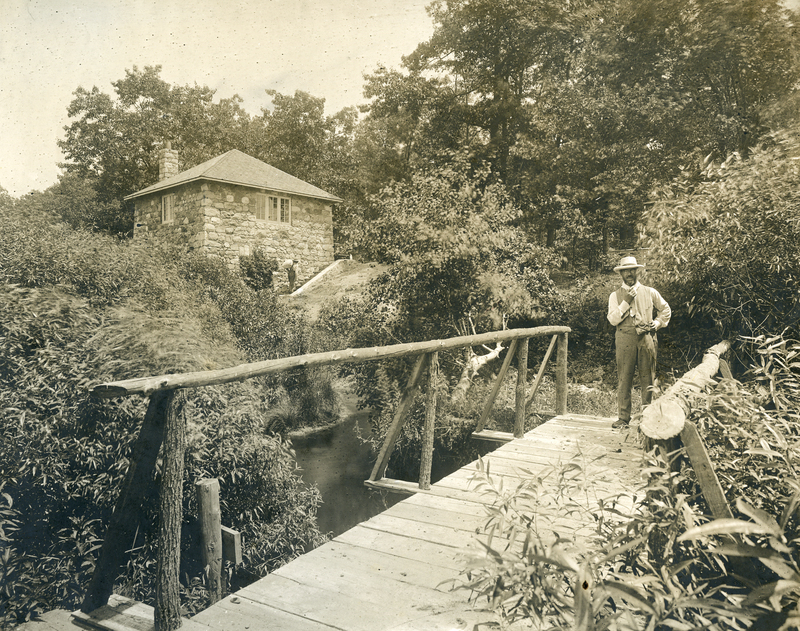 John P. Bexell descended from a long line of woodworkers. Born in Korstrask, Sweden in April 1899, he emigrated to the U.S. and settled in Flint, Michigan in the 1920s. He had made looms back in Sweden, and when he made the first to Saarinen’s specifications he saw potential in the design and made others to sell. Loja Saarinen and her weavers were so pleased with the new Bexell-made loom she immediately ordered more. Other weavers ordered the looms too, and Bexell also received a commission from the federal Farm Security Administration for several hundred looms. His career as a loom specialist took off. In 1945, at Loja Saarinen’s suggestion, Bexell named his now quite popular (and profitable) loom the “Cranbrook Loom.” He produced the looms with his son, Bert, in Flint until 1977, when he sold the business. All that to say, I still needed to get a Cranbrook Loom across campus. Our first victory! Getting the loom out of the weaving studio and into the truck. Ed looks pleased. Working with my colleagues Leslie Mio and Matt Horn, along with Matt’s husband Marc Meyers and game members of Cranbrook’s moving crew Ed and Trevor, we got the loom on the go. 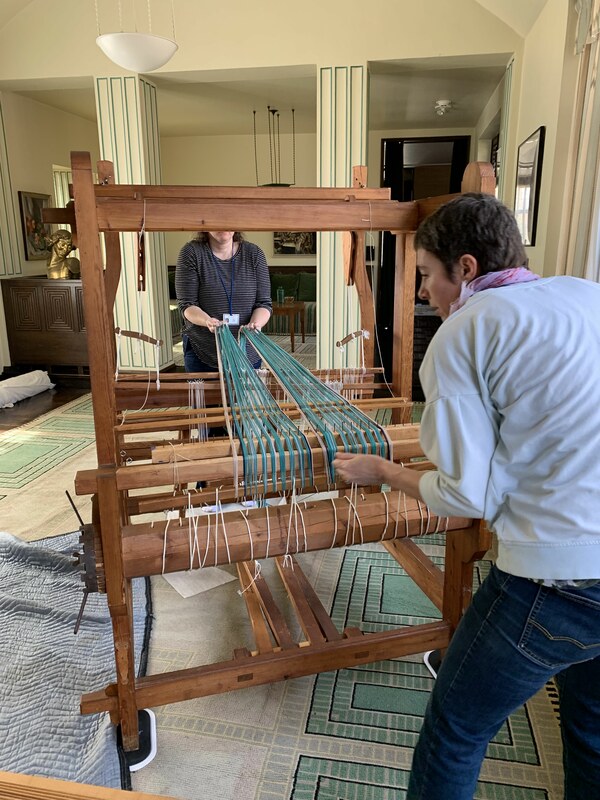 To exit the weaving studio, we each grabbed a leg of the loom and walked it above the others and out of the double doors, through the courtyard, and into the moving truck. Trevor, Marc, Matt, and Ed walking the loom toward increasingly smaller doors. At Saarinen House, we had to remove the warp stick catcher to get the loom through the door. It then had to turn completely on its side to fit through the narrower interior doors. Nothing but our nerves were harmed in the process. The belief that it will fit! The concentration demanded by stripped screwheads! You might be thinking to yourself, don’t looms come apart? Well, yes. However, the loom had been partially prepped for weaving, and we didn’t want to have to reassemble it from scratch inside the studio. I am not, after all, a loom expert. So instead we twisted and turned until the loom was in place in the Saarinen House Studio! 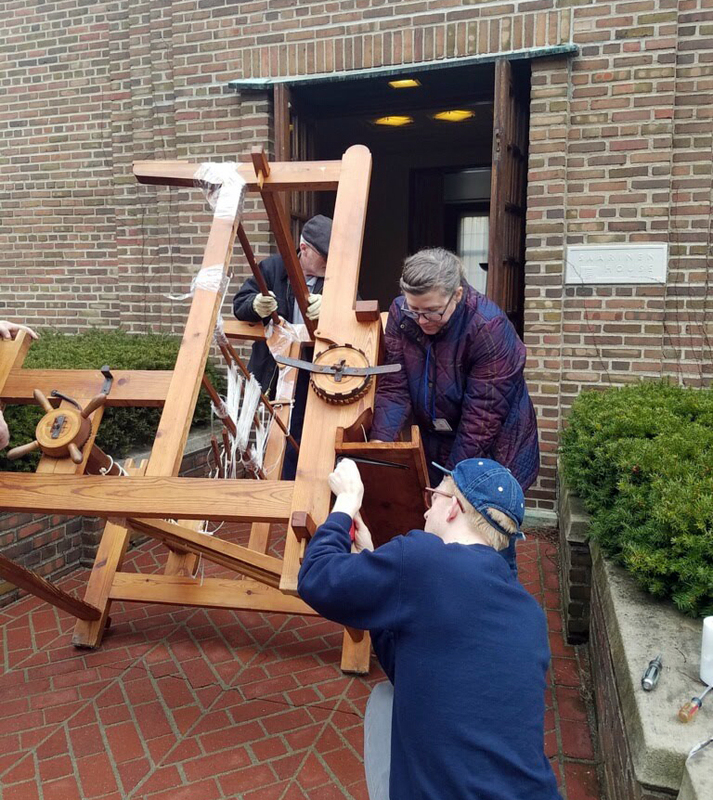 A few days later, Lynn Bennett Carpenter, Academy alumna and instructor in weaving and fashion at Cranbrook Kingswood Upper School, came to finish setting up the loom for weaving a plaid. There was much tensioning, counting, tensioning, threading, twisting, and tying. It was fun, and quite stressful! One wrong heddle threaded, and our weave would be ruined. 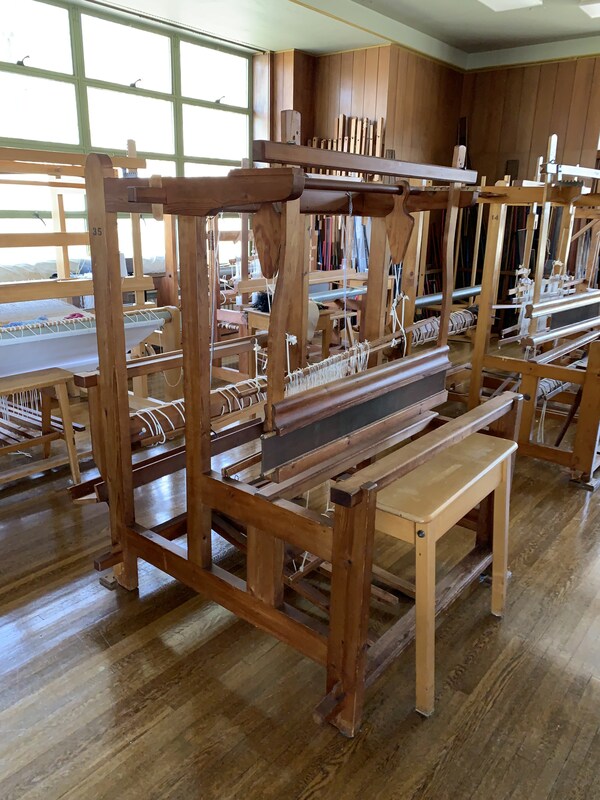 Guests to Saarinen House will now be able to learn about the history of the Cranbrook Loom, see it in action, and even throw the shuttle back and forth to help us make our 12 foot plaid. Tours of Saarinen House start in May and run through December 1, 2019. The exhibition will open during Open(Studios) on April 28, 2019. 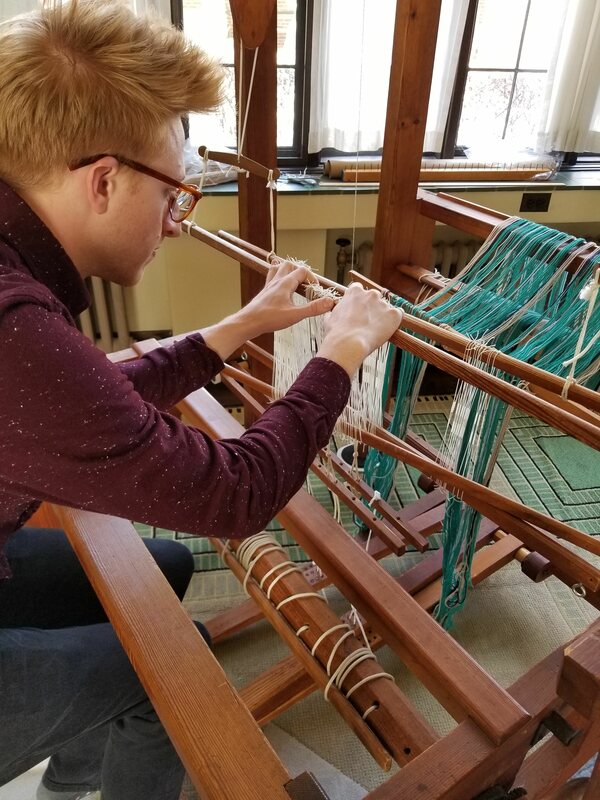 Come and join us to explore the house and exhibition during our free Opening Reception from 1:00—5:00pm, with demonstrations and lessons from Cranbrook Kingswood Upper School weavers! 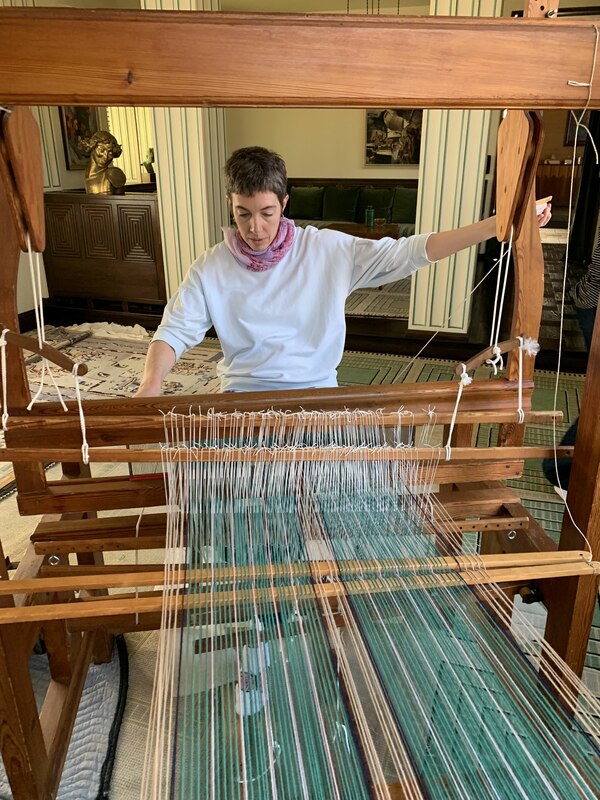 Special thanks to Lynn Bennett Carpenter for loaning us the loom, for her time prepping the loom, for volunteering her students to assist in our Open House, and for teaching me how to weave. In celebration of “March is reading month,” I began thinking upon writing about something book-related. As I kept on thinking about it, I discovered more and more fun things, and ended up with a blog post that covers 1300 years of reading-related history that brings us right up to the minute; well, last weekend at least. Sounds like a lot for a short blog post but don’t worry, I’ve squeezed the first 700 years into one paragraph. And so to begins with illuminated manuscripts, which were written and decorated entirely by hand—the only way to make a book in the medieval period. Reflecting the spiritual focus of medieval society, its art was always divinely-inspired. Illuminated manuscripts are among the most beautiful examples of how medieval artisans sought to create something glorious that was, at the same time, a thing to be used in everyday life. Illuminated manuscripts are most often liturgical texts, such as psalters, which were later superseded by Books of Hours. Medieval literary texts were illuminated as well, including those of Chaucer, Dante, and the tale of Tondal, written by an Irish monk in Germany. One of the most notable of early illuminated manuscripts are the Lindisfarne Gospels, which were written in 715 in the local vernacular rather than Latin. As paper did not enter the European market until the sixteenth century, illuminated manuscripts are made of parchment or vellum. The style of writing or script that you will see in early manuscripts is ‘book hand,’ also known as Anglicana in its slightly differentiated English style, and later texts may use Court or Secretary hand. A Leaf from the Gutenberg Bible, 1450-1455. 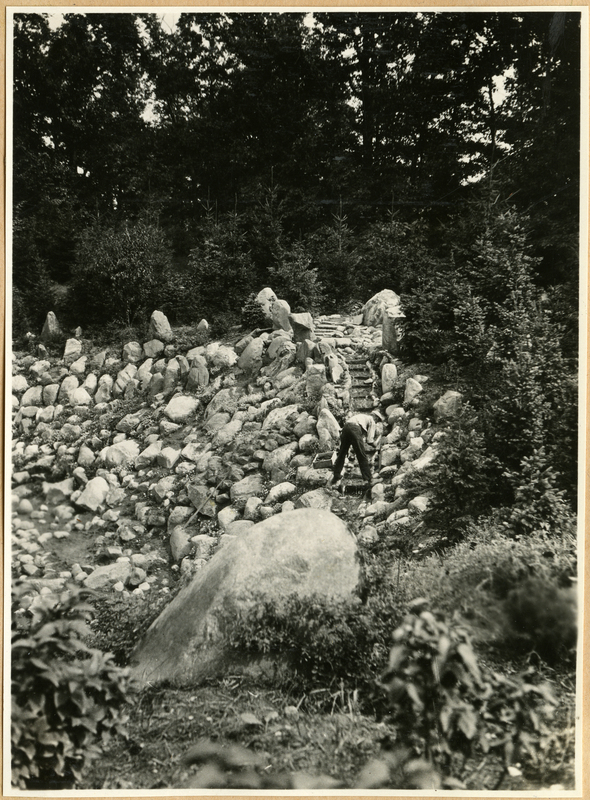 Copyright Cranbrook Archives, Center for Collections and Research. In 1440, Johannes Gutenberg invented the printing press and henceforth the process of making books was changed. 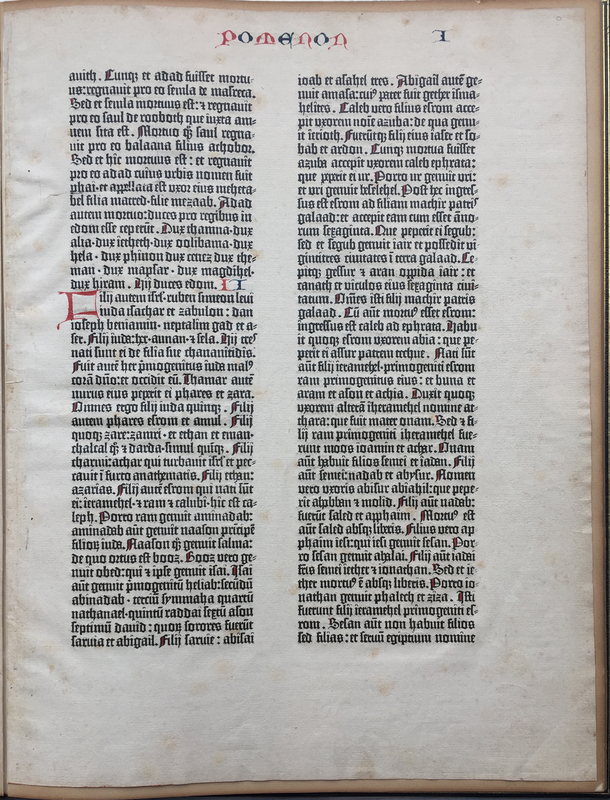 The Gutenberg Bible, as shown in the image above, is one of the earliest books printed using the printing press and it follows the Vulgate translation by St. Jerome that is also one of the earliest illuminated manuscripts. The introduction of the printing press did not put an end to beautifully decorated texts; they became handprinted and illuminated, rather than handwritten. George Gough Booth studied the work of the ancient printers, from Gutenberg and Ulrich Zell—from whom William Caxton learned the craft, to Caxton’s successor Wynkyn de Worde, and Nicholas Jenson. It is Jenson that Booth states perfected the art of printing by improving the Roman characters. The Cranbrook Papers are printed in a modern adaptation of Jenson’s Roman typeface. The Cranbrook Papers, Volume 4 George Gough Booth Papers (1981-01) 5:2. Copyright Cranbrook Archives, Center for Collections and Research. Inspired by the work of ancient printers and William Morris’ Kelmscott Press, Booth established the Cranbrook Press in 1900. 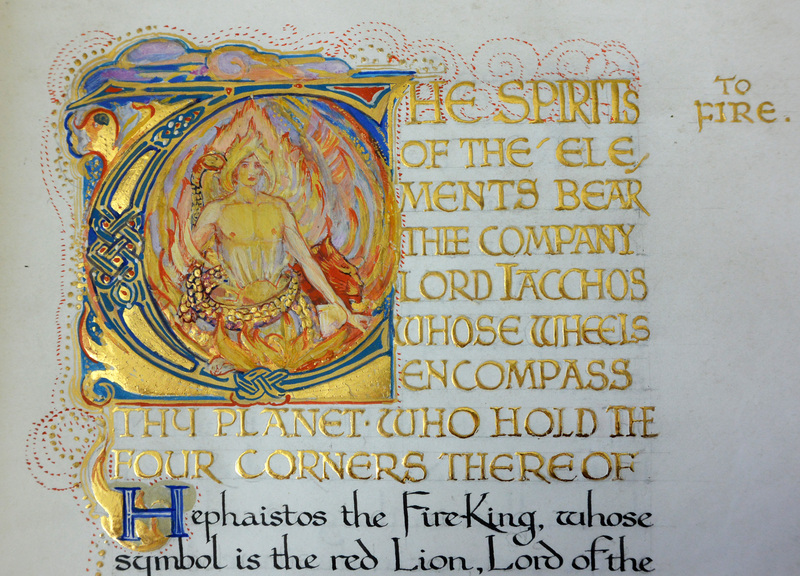 Text was created using a Lion Reliance Press, then the initials and borders were illuminated by hand by Booth himself. Between 1900 and 1902, nine books were printed and decorated in this way, including reprints of books such as the “Dictes and Sayings of the Philosophers” by Caxton, and “Utopia” by Sir Thomas More. The Cranbrook Press also produced original works such as the monthly broadsheet, the “Cranbrook Papers,” and books such as the “Pleasures of Planting”. Lion Reliance Printing Press used at the Cranbrook Press, 1900-1902. Copyright Cranbrook Archives, Center for Collections and Research. “…work most agreeable to my tastes and inclinations that combined the beautiful with pleasant labor and inspired by the record of ancient printers and the modern endeavors of Wm. Morris. I have sought here to begin a modest work for the pleasure of striving to do good work not out of harmony with my chosen life work”. Although the Cranbrook Press ceased in 1902, Booth’s vision to combine the beautiful with good work has an enduring presence at Cranbrook Educational Community. The materials that are preserved and made accessible at Cranbrook Archives help us remember and perpetuate this vision in each of the institutions that form the community. 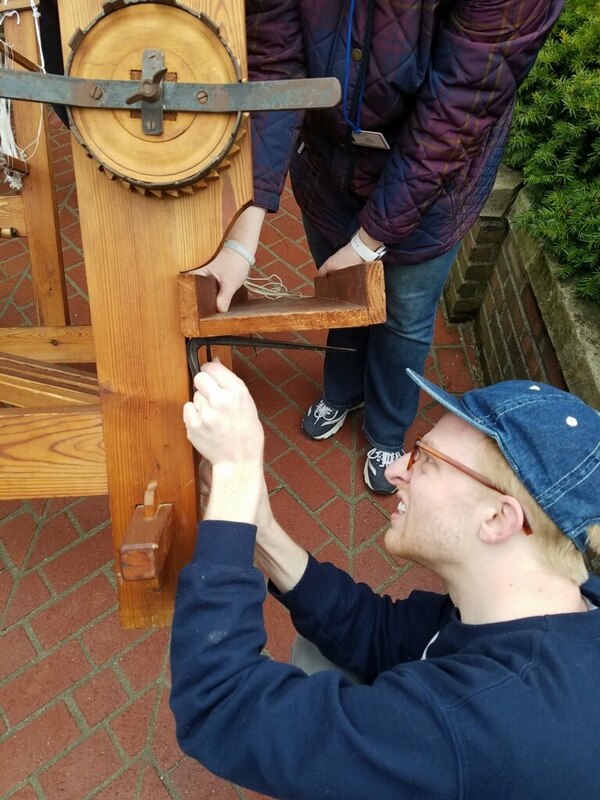 Last weekend, the Center for Collections and Research hosted an event in collaboration with Signal-Return in Detroit that really shows how the archives can inform our knowledge of local history and inspire the cultivation of handcrafted art. The event, ““Work Most Agreeable”: George Booth and the Cranbrook Press,” was a presentation and hands-on letterpress workshop where participants created handprinted poster with one of George Booth’s mottos using the traditional letterpress method that Signal-Return still employs. Letterpress Workshop process. Copyright Cranbrook Archives, Center for Collections and Research. A poster using one of George Gough Booth’s mottos handprinted at the Letterpress Workshop at Signal Return. Copyright Cranbrook Archives, Center for Collections and Research. The Center of Collections and Research hosts many events throughout the year, you can see what’s coming up next here and join the newsletter to keep up to date. 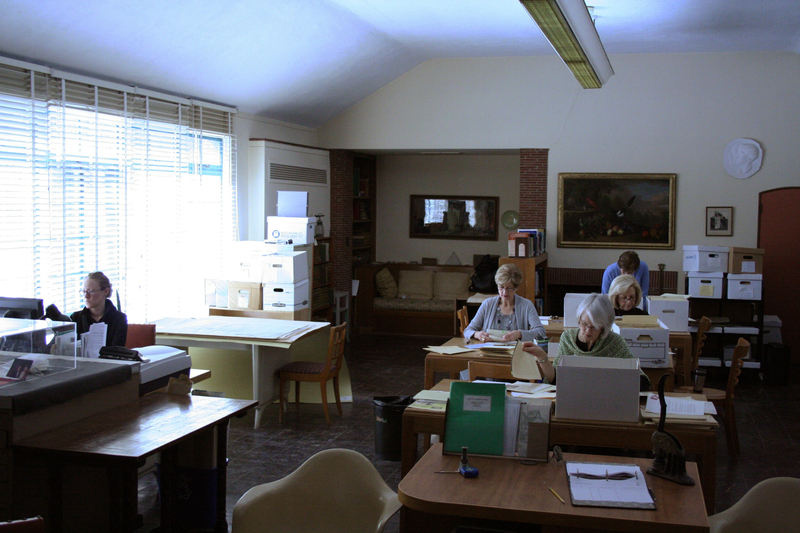 The pursuit of historical truth, from national heritage to community identity or individual biography, depends upon archives—the portion of records selected for permanent preservation. In the west, recordkeeping emerged within the development of justice and administration—the earliest English law code is that of King Aethelberht of Kent, c.600, following the arrival of Augustine of Canterbury and the encouragement of peaceful dispute resolution. Henceforth, a fundamental and enduring feature of legal process comes to us from the Anglo-Saxons: the writ and the charter. Yet, throughout the early middle ages, grants and other legal deeds were made in public ceremonies where the attendant witnesses were the ‘memory’ of the act, not always supplemented by a charter. But, by the thirteenth century, documentary evidence had become necessary to prove ownership of land or other grants of the king, and records began to constitute the activity itself. Over time, the type, format, and number of records has proliferated but those that are preserved, as archives, are the critical vestiges of ancient and recent memory—individual memories, institutional memories, national memories. They are primary sources essential to historical method to evidence claims of historical fact based on a reasoned interpretation of the records—these are the tasks of historians and scholars whose published research is found in secondary sources. 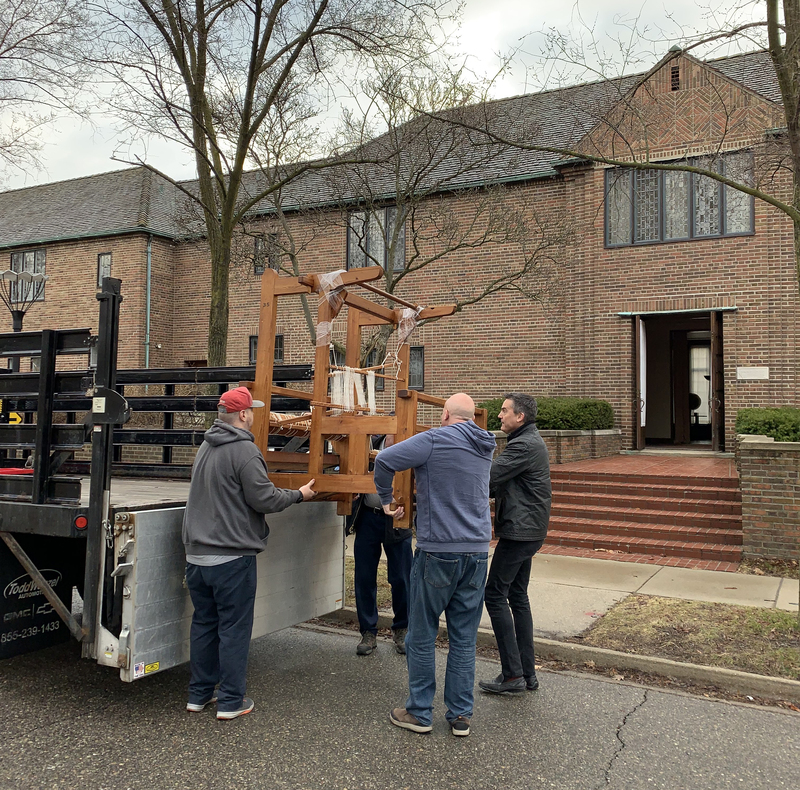 Both types of sources are necessary when greeted with the archival FAQ, “I want to know more about this person, place, or thing—what do you have?” A recent request related to a church vessel, the “gold ciborium” at Christ Church Cranbrook. As is the case with any research, the starting place is to discover what has already been done. 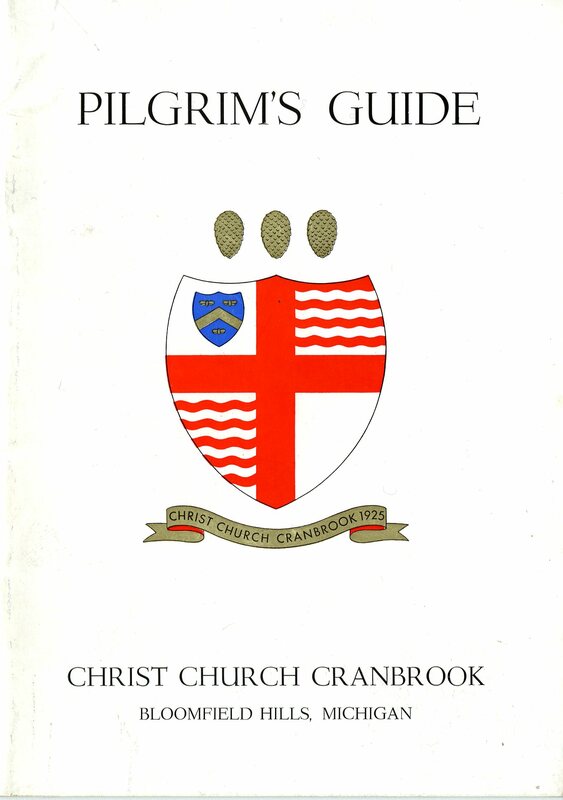 The first place to look for information on the art works at Christ Church Cranbrook is the Pilgrims’ Guide, first published in 1939, which guides visitors through the church with details of its artworks and craftsmen. While the Guide is full of meticulously researched information, there was no mention of a ciborium. The reference files were similarly silent, except a photocopied memo from George Gough Booth dated 1927, listing a ciborium made by Arthur Stone (1992-01 5:2). And, sure enough, in the George Gough Booth Papers (1981-01, 22:7), there is correspondence with Arthur Stone about a gold-plated ciborium. Voilà! Well, not quite… it was not the right one. 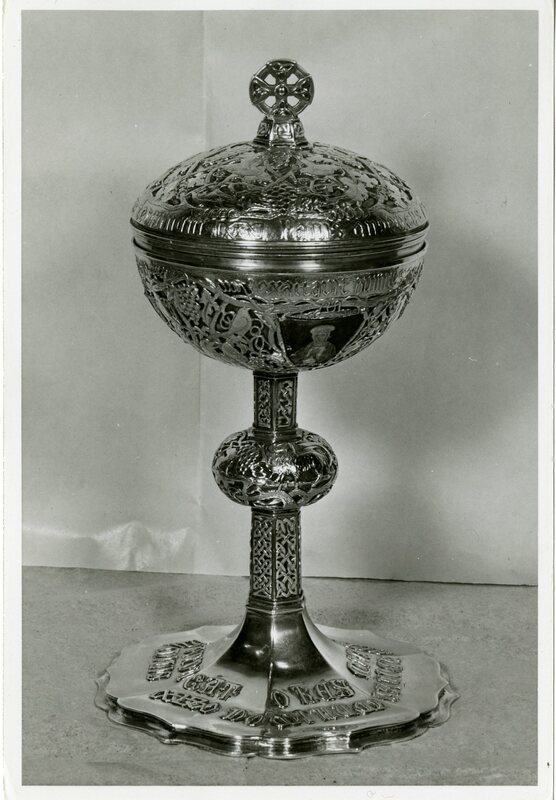 So, we found a photograph of it in the photo files, though it had no date, photographer or artist details, only the words “silver gilt ciborium”. Copyright Cranbrook Archives, photographer unknown. An inventory written by Henry Scripps Booth in 1960 (1981-01 20:6) has two ciboriums listed—that of Arthur Stone and another one with blanks for the creator and date of creation. But, taking a step back to the contemporaneous records for the building of the church, there are detailed ledgers for its construction and decoration. If the ciborium was purchased by George Gough Booth, there would most certainly be a record of it. 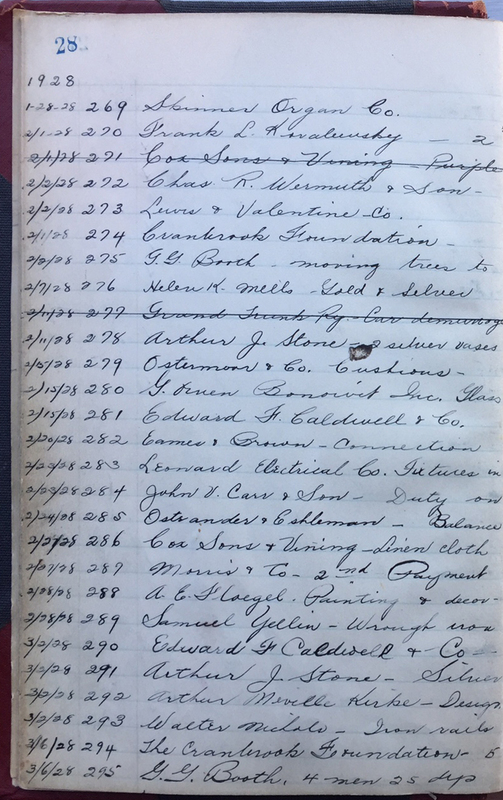 Looking closely at the ledger pages, it is clear that a ciborium was commissioned from three separate artists: A. Nevill Kirk, Arthur Stone, and Helen K. Mills. These have certificate numbers which can be matched up with the ‘Cranbrook Church notebook’. So, we know that a third ciborium was purchased from an artist called Helen K. Mills, and the notebook gives us the date, February 7, 1928. There is correspondence with Kirk and Stone in the Christ Church Cranbrook series of George’s papers but none with Helen Mills. But there must be some elsewhere. When we are processing archives, we must carefully consider three things: content (who created the documents and what is in them? ), context (in what circumstances were they created and why? ), and structure (how do they relate to other documents in the collection and the institution?). These things can also be applied in using archives. 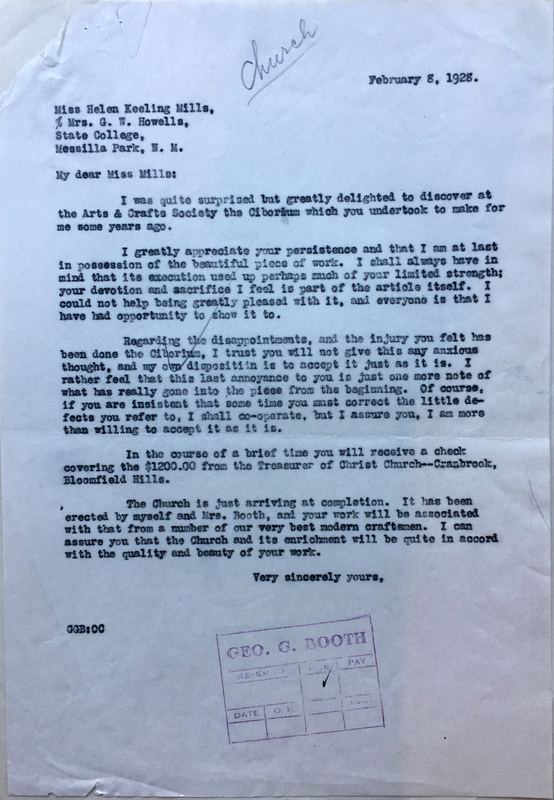 So, in looking for correspondence with artists regarding artwork at the time of the construction of the church, there is another place to look—the Detroit Society of Arts and Crafts correspondence. 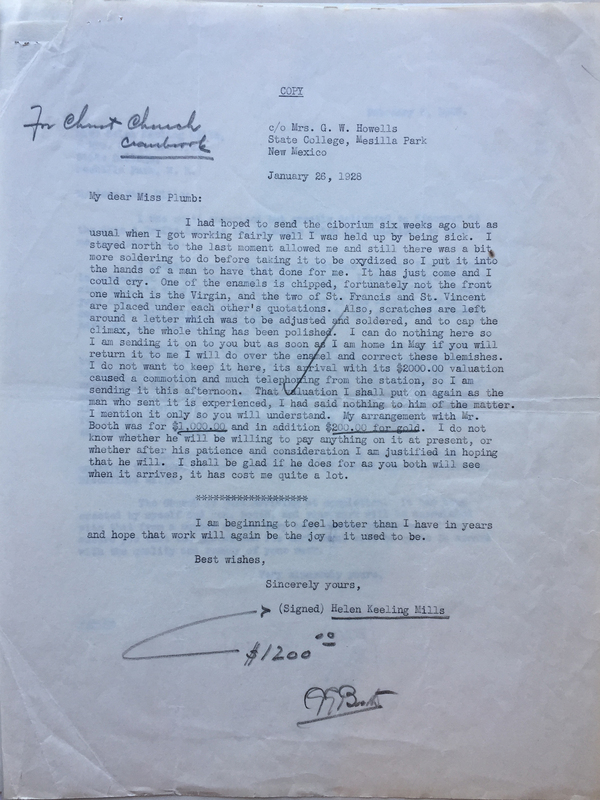 Here we find correspondence between Helen Keeling Mills, Helen Plumb, and George Gough Booth. While records might initially be kept to evidence an activity, over time they are of historical value. They can help us understand a person, provide knowledge of an organization, contribute to knowledge of a craft or a culture, they inform us of the creation of an object so that it may be maintained and preserved in its most beneficial environment. Last, but not least, a document becomes an artifact in itself because of who wrote it, what it says, and because it is simply beautiful. This correspondence was kept initially to document his transaction with Helen as part of the wider collection of records for the church. But we can learn much more from it. We know something about the creative process of the ciborium—what it is made of, the saints depicted upon it, that it was sent to another artist after which it was damaged. We know the importance that Helen placed in her work and her regret of the damage. We can see George’s gracious response and understanding—his appreciation of her devotion to her work and the joy that will be taken in the object she created. This research query helped to draw information out of the archive that was hitherto not expressly known. There is now a reference file to aid future researchers so that the knowledge is accessible with references to the records that document it, and the research process need not be made again. 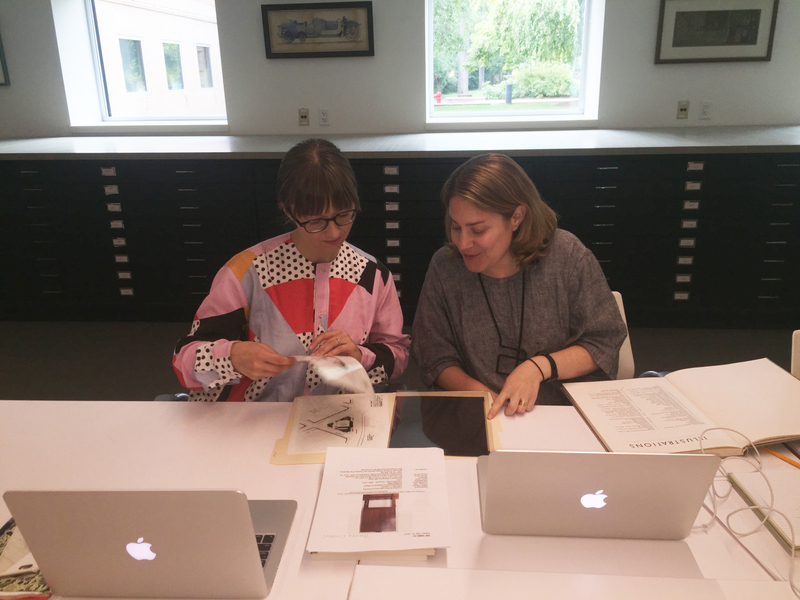 And so, just as teachers learn from their students, the archive and archivists learn from their researchers. When I started giving tours of Saarinen House more than twenty-two years ago, I was enthralled by the geometric designs architect Eliel Saarinen and his wife Loja Saarinen created for their own home. Second Floor Hallway Seating Alcove reproduction curtain, circa 1993-94. Balthazar Korab, Photographer. In the Second Floor Hallway Seating Alcove, I tended to focus upon the dramatic dance between Loja’s curtain design and Eliel’s leaded glass windows. Her woven bands of blue and green triangles layered over his geometric forms. His leaded triangles, squares, and rectangles peeking from behind her sheer textile. The combination of the two casting mesmerizing shadows across the upstairs walls, shifting with the weather and the season. As a decorative art historian, I reveled in sharing the story of the Saarinens’ support of Finnish National Romanticism—a late nineteenth- and early twentieth-century movement celebrating the revival of Finnish language and culture, particularly architecture, arts, and crafts. 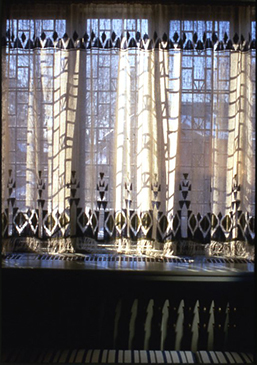 And to my eye, the upstairs curtain was just another pattern derived from the Saarinens’ Finnish heritage, specifically traditional Karelian motifs found in eastern Finland and Russia. And to the Blue Maiden’s homestead. Take me, Tapio, for thy hero. Could a figure from the Kalevala be hidden within the bands of triangles on the upstairs curtain? The Kalevala recounts Finnish and Karelian folklore—heroic tales spanning the story of creation to the introduction of Christianity. Compiled by Elias Lönnart from oral tradition, it was first published in Finnish in 1835 and expanded in 1849. Many translations followed, often with creative spellings. With ever-increasing nationalism—leading to the creation of Finland as an independent country in 1917—Finns, particularly artists, makers, musicians, and performers, turned to the Kalevala for inspiration. Apparently, the Saarinens were no exception. 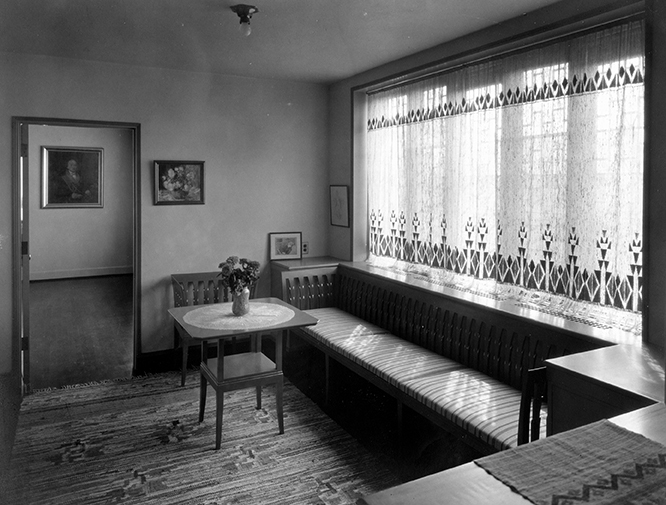 Second Floor Hallway Seating Alcove with original curtain, circa September 1930. Max Habrecht, Photographer. Courtesy Cranbrook Archives. The original curtain for the upstairs seating alcove was designed by Loja Saarinen and woven by Studio Loja Saarinen, circa 1930. Bands of triangular forms embellish the top and bottom of the sheer panel. In typical northern-European style, its purpose was to provide a level of privacy without preventing limited daylight from streaming through. Fitting, as the Saarinens took breakfast upstairs in the west-facing seating alcove each morning at 7:30 a.m. Sadly, Loja Saarinen’s original curtain no longer exists. And other than the black and white photograph and magazine caption, there is no archival documentation—sketches, studio production records, receipts, or letters—to reveal Loja’s intentions or inspirations. Close analysis of the black and white image does reveal two shades of color—presumably blue and green as stated in the magazine caption—enabling the Saarinen House restoration team to determine which color was applied where. Second Floor Hallway Seating Alcove reproduction curtain circa 1993-94, detail. Balthazar Korab, Photographer. 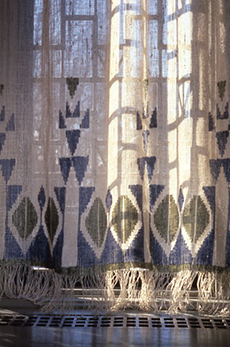 The curtain was reproduced in 1992, by Paula Stebbins Becker, designer and Laura Sansone, weaver. Based on Loja Saarinen’s original design, two horizontal repeats—one at the bottom and one at the top—were woven in blue and green. Measuring 61 inches by 140 inches, the reproduction curtain was constructed with linen warp, lumpy low linen weft, and wool inlay, using a plain weave with supplementary weft inlay border, and fringe. With my newfound Kalevala clarity, the repeating pattern of Loja’s textile took on new meaning. The stacked blue triangles at the bottom of the curtain suddenly assumed the form of a towering male figure sprouting a green triangular head. This recurring figure now balanced upon blue cliffs. And blue hills and trees, flanked by green meadows, unfurled below him, while blue mountaintops and clouds danced above. The scale of the figure in relation to the surrounding elements suggested a deity or hero, not an ordinary man. The central figure of the Kalevala, Väinämöinen is the symbolic first man. Of mythical origins, he rises from a primordial realm beneath the sea. An ancient hero and wise man—think Gandalf or Dumbledore—he possesses a magical voice for song and poetry. He contributes to the creation of the world by cutting down forests and mowing meadows. Sacred bird in sacred branches. Some were made from skin of marten. In this soil to sprout and flourish. Excerpts from “Rune II: Wainamoinen’s Sowing” as translated by John Martin Crawford in his 1888 publication, The Kalevala: The Epic Poem of Finland based on a German translation by Franz Anton Schiefner published in 1852. Or was it Tapio himself gracing Loja’s curtains? The God of the Forest and Woodlands, Tapio is the personification of Nature. Described as a tall, slender figure, wearing a coat of tree moss and a fir-leaf hat, the proverbial Green Man was said to have a lichen beard and eyebrows of moss. Cue the green triangle atop Loja’s figure—perhaps a stylized pre-Christian foliate head? To the joy of all that listen! Musical inspiration for the curtains? We can hear Tapio’s horn and the mystical vibrations of Tapiola—the forest where Tapio lived and ruled—in the haunting tone poem “Tapiola” by the Saarinens’ close friend and noted Finnish composer, Jean Sibelius. Click here to listen to “Tapiola,” Opus 112 as performed by the Gothenburg Symphony, conducted by Detroit Symphony Orchestra Music Director Emeritus Neeme Järvi, set to scenes of Finland’s forests, lakes, rock formations, and clouds edited from the 1984 Christopher Nupen film, Jean Sibelius: The Early Years, and published on the GreatClassicRecords YouTube channel in 2012. Yet, Väinamönen plays his own role in Sibelius’s repertoire. “Väinö’s Song,” a cantata for mixed chorus and orchestra, evokes the song of our hero as a suitor in “Rune XVIII: The Rival Suitors” from the Kalevala. Click here to listen to “Väinö’s Song,” Opus 110 as performed by the Finnish National Opera Orchestra and Chorus, conducted by the late Eri Klas, former Principal Guest Conductor of the Finnish National Opera. Sibelius composed “Väinö’s Song” in 1926, and it was first performed in Sortavala, Republic of Karelia, Russia, in June of that year. Simultaneously, he was working on “Tapiola,” a commission from the New York Philharmonic Society first performed in New York the day after Christmas 1926. However fanciful it might be, I like to picture the Saarinens in the 1926 Karelian and New York audiences, supporting their good friend’s compositions and drawing inspiration for their own work. The timing is feasible as they summered in Finland and resided in Michigan during the winter—their custom excepting the war years. But more likely, they learned of the compositions through their regular correspondence with Sibelius, now in the collection of the Sibelius Museum. Perhaps the subject of a future blog post and my excuse for another trip to Finland? It is fair to assume that by 1930, when the upstairs alcove curtain was created, the Saarinens were familiar with “Väinö’s Song” and more so, “Tapiola,” now considered to be Sibelius’s last great masterpiece for orchestra. In all, Sibelius created over a dozen works inspired by the Kalevala. He profoundly impacted the development of the Finnish national identity—and thereby the Saarinens’—adding another layer of interpretation to Loja’s figurative pattern. Karelian geometric patterns? Väinämöinen creating the world? Tapio ruling the forest? Whether the curtain in the Second Floor Hallway Alcove at Saarinen House depicts Tapio, God of the Forest and Woodlands . . . or Väinämöinen, the hero of the Kalevala . . . or simply references Karelian geometric patterns, I do not know. But it seems clear that Finnish Nationalism Romanticism impacted Loja Saarinen’s textile designs, reflecting both tradition and her distinctive sense of visual harmony in their arrangement of color and form. A trained sculptor familiar with traditional weaving, Loja established Studio Loja Saarinen at Cranbrook in 1928 in order to supply textiles for the growing campus. This led to the formation of the Department of Weaving and Textile Design at Cranbrook Academy of Art, for which she served as Head from 1929 until her retirement in 1942. Studio Loja Saarinen was initially engaged in creating textiles for Kingswood School for Girls and the Saarinens’ own home at Cranbrook. 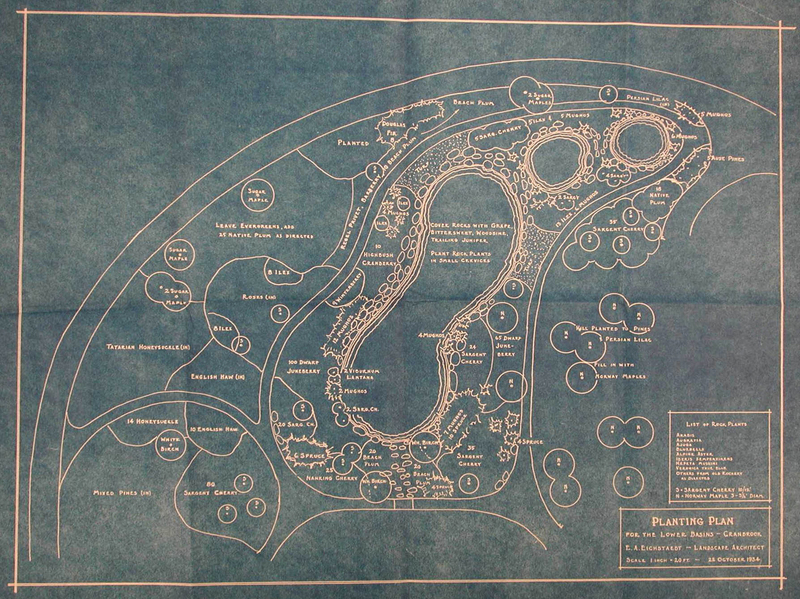 The studio also received commissions from major architects of the period such as Frank Lloyd Wright. Textiles designed by Loja and Eliel Saarinen for Studio Loja Saarinen continue to grace the interiors of notable edifices designed by Eliel, including First Christian Church in Columbus, Indiana, and, of course, Saarinen House. Tours of Saarinen House resume on May 3, 2019. And our upcoming Day Away trip just happens to be to Columbus, Indiana—tentative dates: May 17-19. We hope to see you next season. In the meantime, don’t forget to celebrate Kalevala Day on February 28—commemorating the date of its first publication by Elias Lönnart in 1835! Might Willy not carve something for you? Oberammergau, a small Catholic village in Bavaria, Germany, is known for its woodcarvers and for its almost 400-year tradition of mounting an elaborate Passion Play. The Village of Oberammergau, 1922. Courtesy of Cranbrook Archives. The Passion Play is performed in years ending with a zero. Due to economic instability, however, the 1920 performance of the Passion Play was postponed to 1922. Oberammergau Passion Play Theater, 1922. Courtesy of Cranbrook Archives. That year, Henry Scripps Booth and his friend J. Robert F. Swanson were traveling on a ten-month-long European tour and decided to see the rescheduled Passion Play. Henry and Bob stayed at Max Spegel’s pension in Oberammergau, Germany. It was there Henry met Herr and Frau Spegel, their sons Wilhelm and Max, and their daughter Sophie. After the trip, Henry corresponded with Frau Spegel and her son Wilhelm, until about 1937. Wilhelm and Max Spegel at their father’s Pension, 1922. Courtesy of Cranbrook Archives. Henry Booth with Wilhelm and Max Spegel at their father’s Pension, 1922. Courtesy of Cranbrook Archives. In January 1924, Frau Spegel suggested, because some items Henry had ordered in Oberammergau had never arrived, “Dear Friend, might Willy [Wilhelm] not carve something for you?” From then on, Henry was agreeable to having the Spegel family carve wood panels, gates, doors, and ceilings for his new home, Thornlea. Wilhelm Spegel, 1922. Courtesy of Cranbrook Archives. Warming Oven Doors in Thornlea Dining Room, 1926. In the Thornlea Dining Room is a Three-section Sideboard with Carved Panels, 1926-1929, incised with geometric, floral, figural, and animal decorations. Wood panels depict figures such as Adam & Eve, Lindberg, Chief Pontiac, and Columbus. In order to help his friends, Henry designed a three-section sideboard, into which he inset carved panels done by Wilhelm and Max Spegel — the original idea was to have the panels used as a frieze around a room, but that never materialized. Henry paid the Spegels $8 per panel and let them have creative input into the design and subject matter. The ceiling of Thornlea Oratory, circa 1926. In 1929, Wilhelm had the idea to come to America, as jobs for woodcarvers were scarce at the time. He had asked Henry to “write a letter to the American Consulate in Stuttgart . . . so that they know who I am and that you have known me for many years.” There is no mention of the said letter in any of Henry’s replies but later letters indicate the move to America did not happen. Wilhelm Spegel, Carolyn Farr Booth, and Max Spegel in Oberammergau in 1930. Courtesy of Cranbrook Archives. Letters from the Spegels stop in 1937. We do not know what happened to Wilhelm Spegel after 1937 except that he was married on April 17 of that year and died in 1951. We do know that Max Spegel (the younger) served in the German Infantry during World War II and died in service in 1942 at the age of 30. His name appears on the war memorial in Oberammergau. One item of note, and a fact that Henry S. Booth himself pointed out in a letter to his sister: George G. Booth’s favorite woodcarvers John Kirchmayer and Alois Lang were from Oberammergau, Germany. Henry seemed happy to have found his own carvers in the same city. Some of my favorite blogs, such as My Modern Met, capture the connections between science and art. At Cranbrook, the intersection of these two worlds often occurs when I delve into a research request. I recently found myself in this happy place as I discovered information about the Mary Soper Pope Memorial award, while researching botanist Emma Lucy Braun. Cranbrook Institute of Science awarded the medal to Braun in 1952. First award of the Mary Soper Pope Memorial medal, 1946. 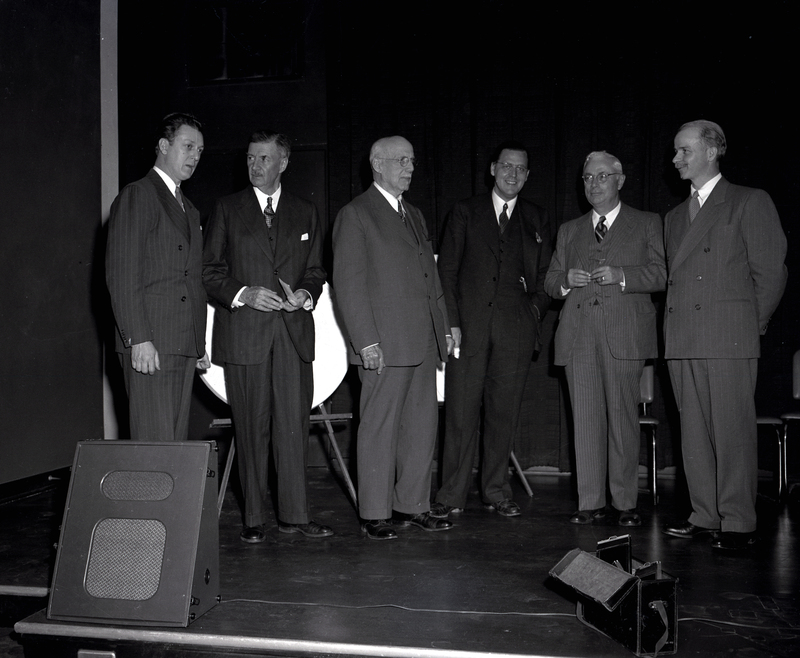 From L-R: Marshall Fredericks, Gustavus D. Pope, George Booth, Franz Verdoorn (recipient), Robert R. McMath, and Robert T. Hatt. Photographer, Harvey Croze. Mary Soper Pope (1872-1940) was the wife of Gustavus Debrille Pope (1873-1952). Gustavus Pope, a Detroit manufacturer and humanitarian, was among many things the director of the Detroit Museum of Art, president of the Detroit Society of Arts and Crafts, a Cranbrook Foundation Board of Trustees charter member, and a board member of both the Cranbrook Academy of Art and the Institute of Science. 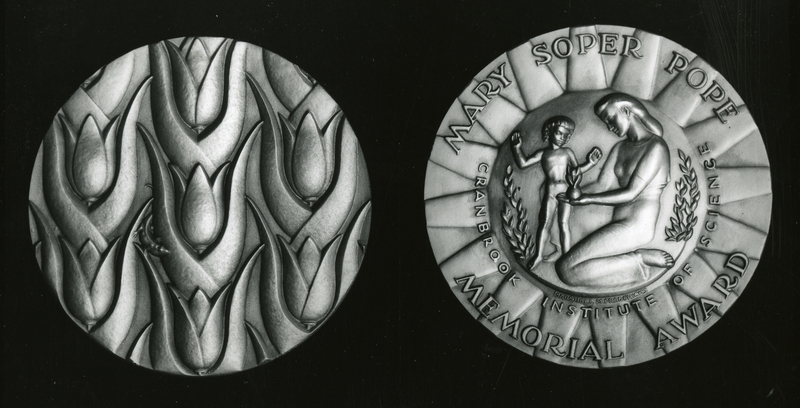 In 1946, the Trustees of the Institute announced the foundation of the Mary Soper Pope Memorial medal to be granted as often as the Board deemed desirable for “noteworthy and distinguished accomplishment in the field of plant sciences.” The award was a memorial to Mary Soper Pope as a tribute to her “thoughtful nature, her quiet yet inquiring spirit, and her constant pleasure in the beauty of growing things.” The Institute Trustees commissioned sculptor Marshall Fredericks (1908-1998) to design the medal. Fredericks taught at Kingswood School and Cranbrook Academy of Art from 1932 until he enlisted in the armed forces in 1942. According to correspondence in the Cranbrook Institute of Science Director’s Papers, this was Fredericks’ first commission since his return from service as a Lieutenant Colonel in the Army Air Forces. I love Fredericks’ design. On the obverse, the medal bears the figure of a woman holding a delicate seedling before the eyes of a child. The reverse is a profusion of vegetal growth and in it a chameleon. Marsall Fredericks sketches, ca 1946. The 3” diameter medals were cast in bronze by the Medallic Art Company in New York. 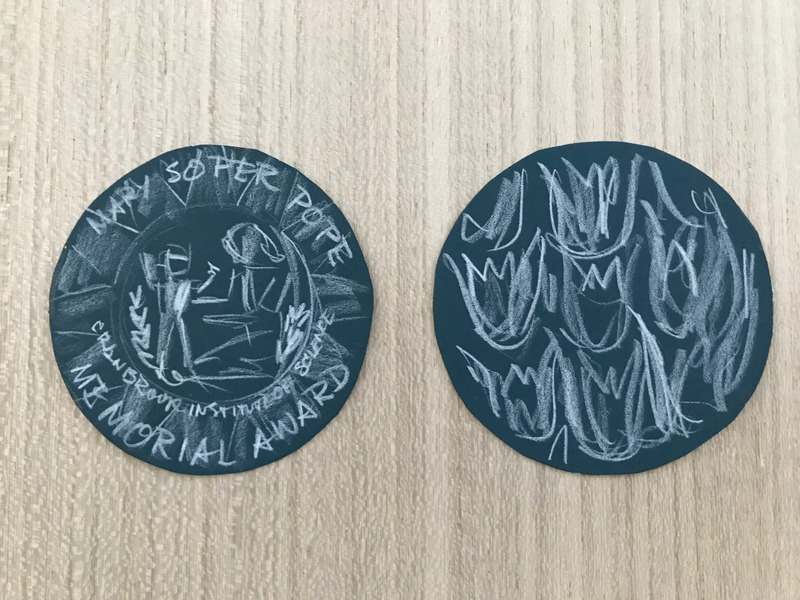 The Committee of the Mary Soper Pope Memorial medal agreed on the following principles: 1) the medal should be given for noteworthy and distinguished accomplishments in plant science, 2) the medal may be given in any field of plant science, 3) the medal should be given in different fields of plant science, 4) the medal should be given without limitation (nationality, race, creed, and academic career or position), and 5) the medal is to be given at any point in a person’s career. With these principles in mind, the Institute awarded the medal to seventeen scientists between 1946-1970, including botanist Emma Lucy Braun, ecologist William Vogt, and soil scientist, Edgar T. Wherry. While I enjoyed the initial research about Braun that led me to reading about this award, I loved following the Detroit and Cranbrook connections between art and science. The work of British arts and craftswoman Jessie Bayes (1876-1970) has been described as ethereal, magical, and an “expression of things felt and seen.” Cranbrook has in its collection three of Bayes’s works, acquired by George Booth between 1920 and 1929. 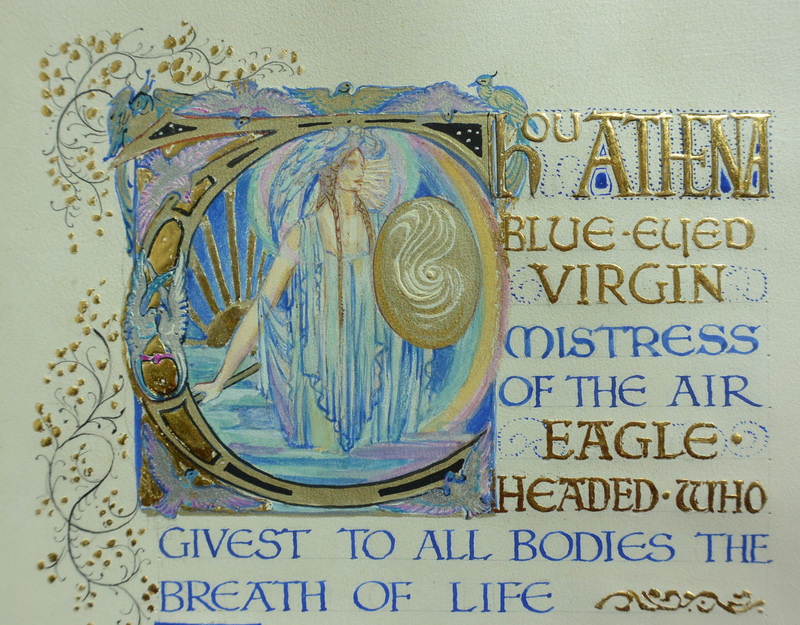 The illuminated manuscript “Hymns to the Elements” is one of her most stunning works. Hymns to the Elements, ca 1923. One of Bayes’ largest and most elaborate illuminated manuscripts. Close-up of Athena, Mistress of the Air. Jessie Bayes was raised in an artistic family where the four children were taught by their father Alfred, an etcher and book illustrator, to appreciate beauty at an early age. Her brother Gilbert became a sculptor, her brother Walter was a painter who also designed theatrical scenery, illustrated books, and lectured about art, and her sister Emmeline worked in enamel. Bayes received art education from evening classes at London’s Central School of Arts and Crafts, which grew directly out of the Arts and Crafts Movement of William Morris and John Ruskin. There, Bayes learned to gild on wood and discovered a love for writing and illumination which she deemed among the strongest of the curriculum. She was also heavily influenced by her employment with Sydney Cockerell, an engraver and former librarian for William Morris. In this role, he had been responsible for completing the Kelmscott Press publications after Morris’s death. Close-up view of Hephaistos, the Fire King. Bayes exhibited widely with the Arts & Crafts Exhibition Society, and at the Royal Academy and the Baillie Gallery in London, alongside artists like Walter Crane, Arthur Nevill Kirk, and Omar Ramsden. In 1922, Bayes exhibited some of her illuminated books, as well as paintings on vellum, fans, and panels, at the Art Center in New York. Bayes gradually expanded her repertoire to include painted and gilded decoration on furniture as well as interior design and stained glass work. Jessie Bayes died in Paddington, Central London in 1970. For Jessie’s personal views on family, life, and art, read The Bayes Saga (1970).